Slideshow: Balmy Bates in December prompts the question, what’s up? Several then-and-now photographs got a nice response on social media this week, so we’re sharing them in Bates News. 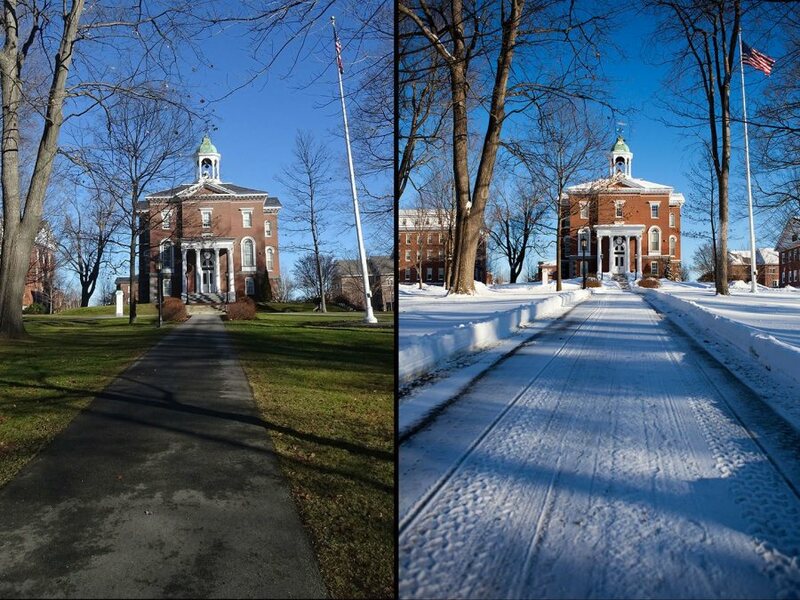 The “before” images are from two years ago, Dec. 16, 2013, when Bates was digging out from about a foot of snow. The temperature was 18 degrees. The wind was blowing 20 mph from the dread northwest. Two years later, it’s a different picture. Like the rest of the East, it’s been balmy; the Quad is green and the wind a mere zephyr. Is this due to climate change? While climate change is a reality, blaming it (or crediting it, for that matter) for this month’s benign weather is a bit like saying that a student’s B grade on her first Bates math quiz happened because of her B average in high school. The two are connected, but too many other factors are at play to draw that straight line. This December’s warmth might have something to do with El Niño, the name of a regular, albeit temporary, period of warmer-than-normal water temperatures in the equatorial Pacific. Still, each El Nino winter produces its own distinctive weather, says Greg Postel ’90, storm specialist with The Weather Channel, so you can’t predict this El Niño from observing past ones. Indeed, the top five warmest Decembers in Portland (2001, 2006, 1996, 1990, 1973) were not during strong or even moderate El Niño winters. That was the winter of the great and infamous Northeast ice storm. Yikes!